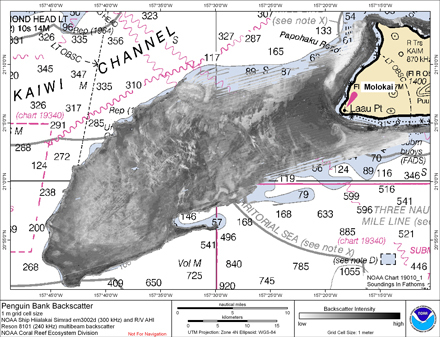 Backscatter imagery extracted from gridded bathymetry of Penguin Bank, Molokai, Hawaii, USA. These data provide almost complete coverage between 0 and 100 meters. The backscatter dataset includes Simrad EM3002d and Reson 8101 data. The sonars frequencies are 300 kHz and 240 kHz respectively and are processed and gridded separately. Because of the similar sonar frequencies the data can be mosaicked nearly seamlessly using GIS software. This metadata is for the Simrad em3002d backscatter data only. These data are not to be used for navigational purposes. NOAA makes no warranty regarding these data, expressed or implied, nor does the fact of distribution constitute such a warranty. NOAA cannot assume liability for any damages caused by any errors or omissions in these data, nor as a result of the failure of these data to function on a particular system.